One of a range of telescopes used on the Galaxy Viewing night, 26-Nov-16. Photo by Robin Rice. Members and Friends meeting, Friday 15-Dec-17 7.30 pm. To be held at the Newton Stewart Centre, Church Street, Newton Stewart, this is the same venue as the AGM and is found just along from the Library. 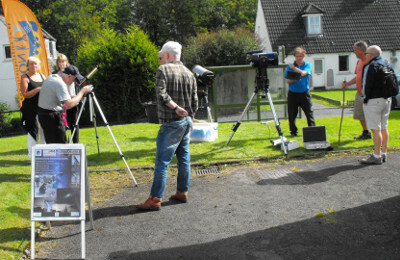 There will be a talk by Mike Alexander of the Galloway Astronomy Centre, and an eclipse video of this year's total eclipse in the USA taken by Brian and Robin Rice. If conditions allow, this will be followed by observing with telescopes outside the Centre. For more on this and other news, download Newsletter 25 from the Downloads page. NGC 6888, also known as the Crescent Nebula in Cygnus, imaged by Brian and Robin Rice on 30-Sep-17. Since this was mentioned as the original target of the Pleiades picture, I am sure many were wondering what it looked like. So here it is, stacked from 29 three minute exposures through a Starwave 110 scope with a modified Canon 600D. It is about 5,000 light years away from us, and is quite difficult to see, usually requiring a special filter for it to show up. 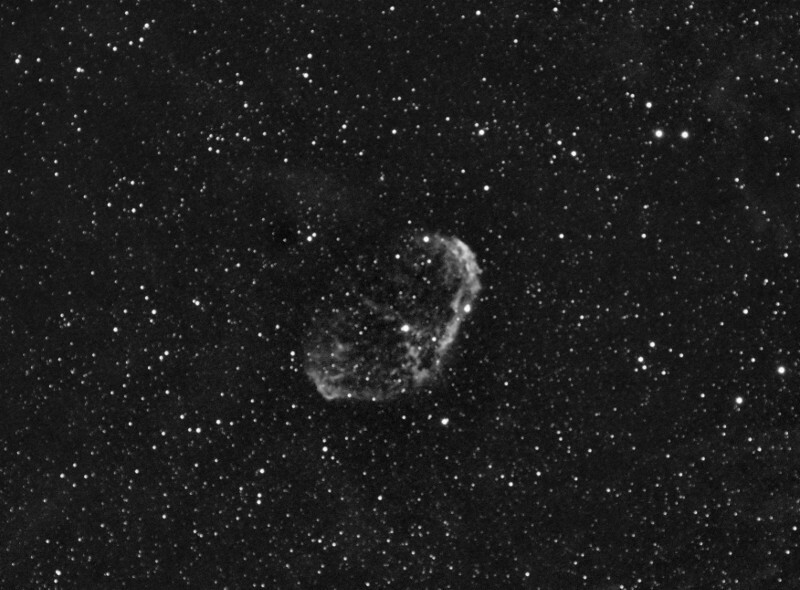 NGC 6888, the Crescent Nebula taken on 30-Sep-17. Image by Brian and Robin Rice. 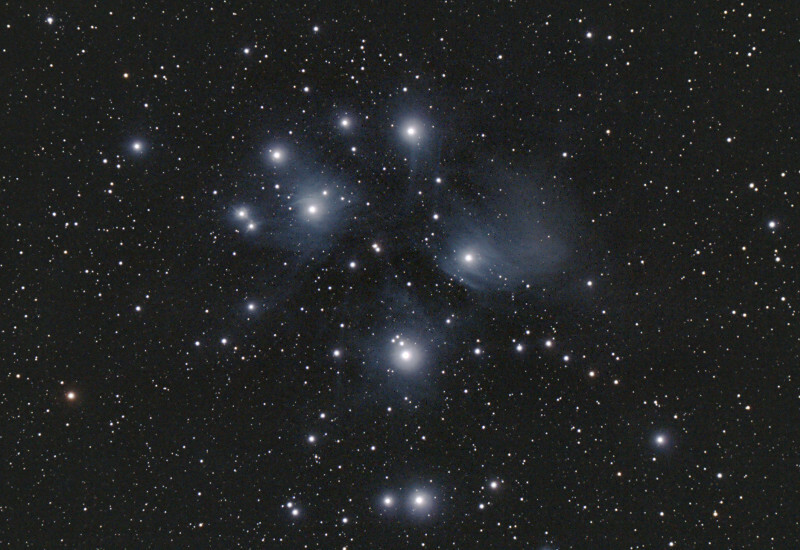 M45, the Pleiades, imaged by Brian and Robin Rice on 16-Sep-17. Although viewing conditions have been poor of late, there have been windows of opportunity as shown by this recently captured image. It is the result of twenty separate two minute exposures taken through a Canon 600D on an Equinox 80 scope. The images were then stacked using Deep Sky Stacker to produce this image. Their first choice of target was the Crescent Nebuala in Cygnus, NGC6888, but that did not work due to alignment problems and the focus changed to M45 instead. M45 the Pleiades, taken on 16-Sep-17. Image by Brian and Robin Rice. Galloway Forest Astronomical Society AGM, on Saturday 28-Oct-17 at 10.30 am. The AGM this year is at the Newton Stewart Centre, Church Street, Newton Stewart. This is just up from the Library building. This is a change from previous years, so please take note and do not assume that it is at the Belted Galloway again, as I did! The AGM is your chance to question the Management Committee, and to stand for election to the committee if you wish. All nominations of office bearers, proposed amendments to the constitution, or any other business for the AGM should be emailed to the Secretary as soon as possible, so that these can be included in the agenda in good time. Stargaze September, Newton Stewart Tennis Club, 23-Sep-17 at 8.30 pm. All are welcome to come and join in the stargazing at our first meeting of the new observing season. There will be no moon, but wrap up warm and bring a flask, and let's see what can be seen! Thanks to our intrepid reporters Brian and Robin Rice, we have great first hand views of the solar eclipse. They were viewing from Menan Butte north of Idaho Falls, Idaho, and totality was at 11.33 am local time, and lasted for 2 minutes 18 seconds. They used a Canon 650d with a 75 to 300mm lens at 300mm, with it set to manual and the aperture set to f8. 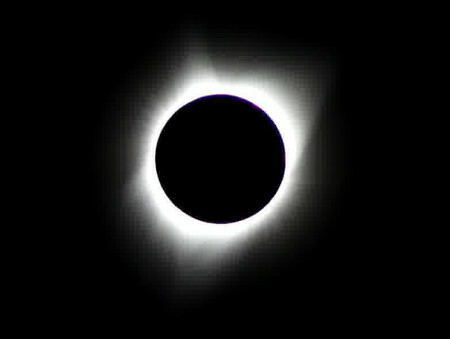 Initially the exposure was 1/1000 sec, and reduced to 1/30 to show the corona during totality. Unfortunately they failed to get a picture of Brian's face when he saw the rattlesnake, but I suppose you can't have everything! Before the Eclipse, Menan Butte. 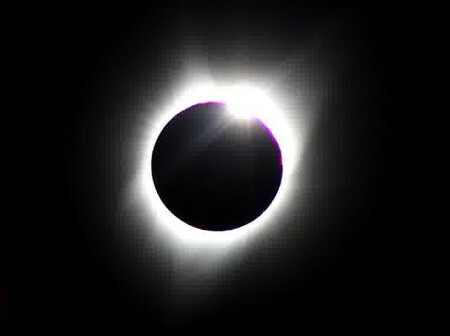 Exposure change to show the Corona. 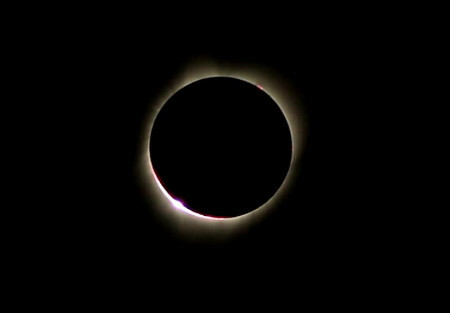 The Diamond Ring, as the sun reappears. 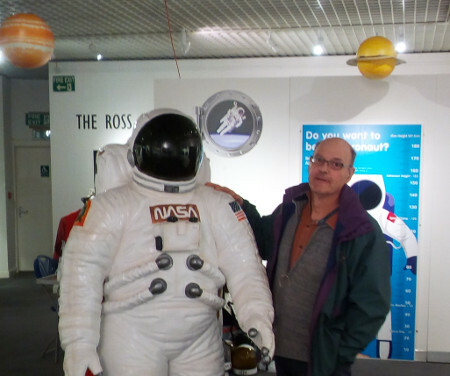 Stranraer Museum Space Exhibition on until September. 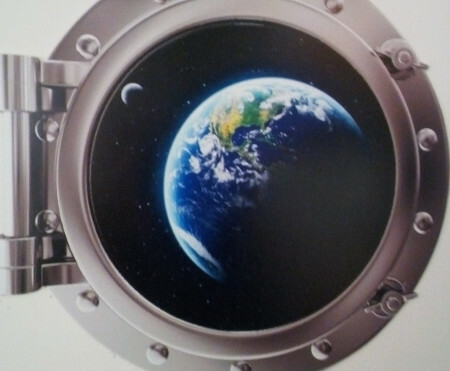 This free exhibition about Space, both the fact and the fiction, is well worth a visit. Our reporters had a preview and report something for everyone, from a one person planetarium to Moonbase modules for children to crawl through, and lots of information and questions to ponder. Antony and friend dreaming of space! A Sense of Scale in Space. GFAS member Andy Sawers sent in this photo of the International Space Station (ISS) taken from Monreith. 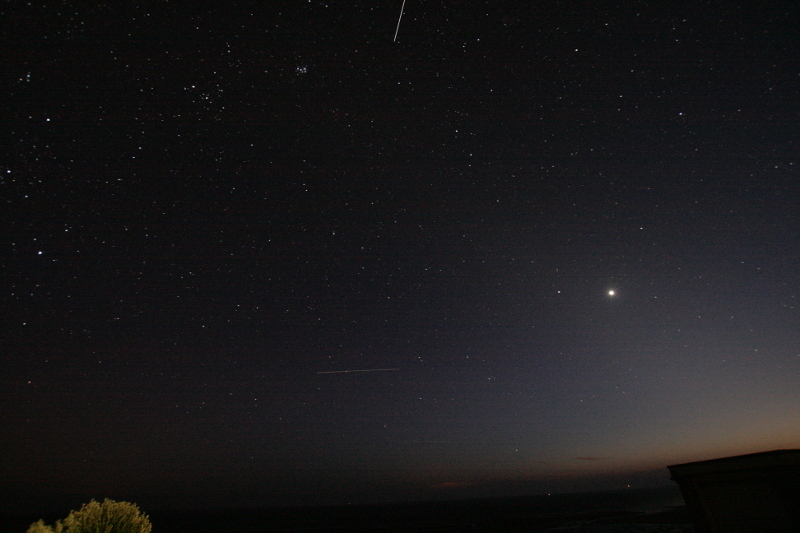 Andy said, "I'm also attaching a photo I took of the ISS streaking right-to-left across the sky near Venus as viewed from Monreith. The ISS was actually tracking over the Pyrenees at the time! The vertical streak is an Italian circumpolar-orbit satellite." A good reminder of just what a busy place the sky has become! More of Andy's pictures can be seen in the April 2017 edition of the Newsletter, available from the Downloads page. For the photographers, Andy used a 30 second exposure at f3.5, ISO 1600. Orion is just starting to show on the left of the image. The International Space Station seen from Monreith. Picture by Andy Sawers. Mebmers Meet at the Tennis Club, 25 March 2017. 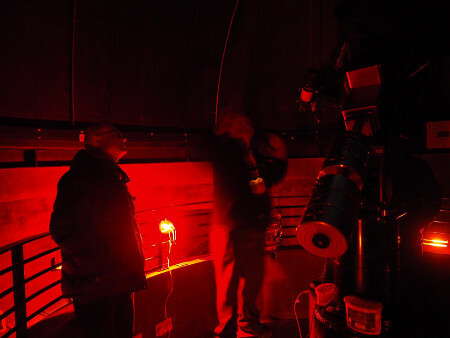 Taking advantage of a stable high pressure system, a short notice meeting was called resulting in a collection of telescopes and members coming together to enjoy the clear view of the night sky. 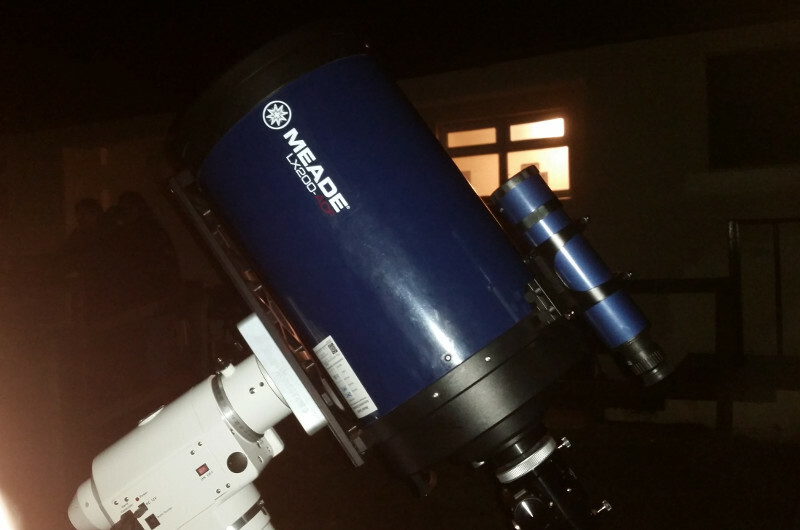 Good views of subjects ranging from galaxies to the moons of Jupiter were seen, and thanks are due to Hunter McCall and to Brian and Robin Rice, for sharing their equipment and expertise with other members. 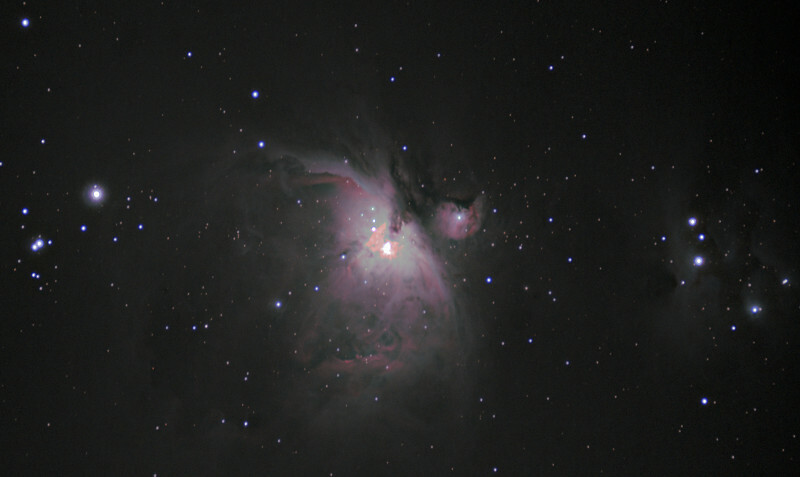 Brian and Robin went on to capture these images of the Leo Triplet and M42. 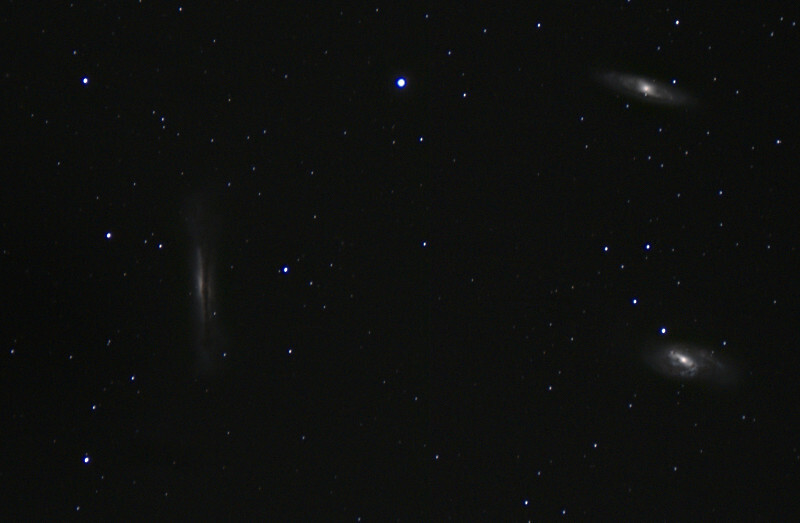 The Leo Triplet is a group of Galaxies about 35 million light years away in the constellation of Leo, and consists of M65 top right, M66 bottom right, and NGC 3628 bottom left. M42 is the Orion Nebula, which is visible to the unaided eye as the middle 'star' in Orion's sword. It lies over thirteen hundred light years away, and is the closest area to us of massive star formation. M42, the Orion Nebula. Pictures by Brian and Robin Rice. 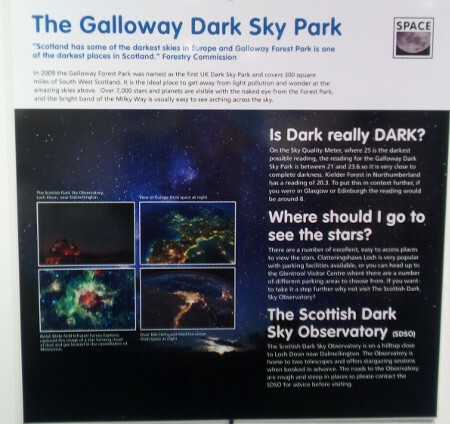 Visit to the Scottish Dark Sky Observatory, 8th of March 2017. GFAS Members at the SDS Observatory. Using the telescopes in the Observatory. Photos by Hunter McCall. Antony's report of the visit follows. We were keen to visit the SDSO even though the forecast for the evening was poor. On arrival at the observatory the astronomer in residence was surprised that the clouds had thinned so that both telescopes could be used. Consequently we were able to view the moon and other bodies, and the group had over an hour to scan the night sky and view twin stars and constellations. All agreed that it was an excellent trip, and a return visit to SDSO will be organised as a result of the success of this one, when we can hope for even clearer skies! Hunter adds that "highlights of the evening, were the surprisingly good views of the moon, double stars and the Orion Nebula, which the 20" Dall Kirkham telescope could reveal despite thin cloud covering most of the sky throughout our visit. 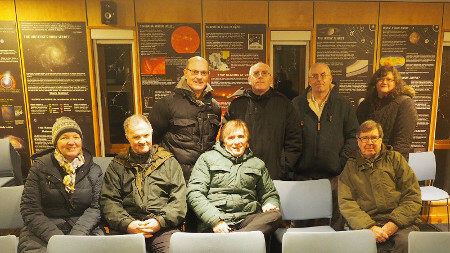 Resident astronomer, David Warrington, kept us well informed during the evening, both within the observatory dome and in the lecture theatre when the cloud cover got too bad for observations to take place." Visit to Astrofest in London, 10-11 Feb 2017. One of our members, Hunter McCall, visited Astrofest this year, and here is his report. During a recent trip to visit some friends in London, I paid a visit to Astrofest in Kensington. This is a yearly exhibition of astronomy related items together with numerous presentations in the conference centre. One I particularly liked was given by Andrea Accomazzo who is the Flight Director of the European Space Agency. He described in detail the various failed attempts they've had a landing probes on Mars "in one piece" and his laid back attitude towards this was bordering on funny. In the exhibition centre, I felt like a little boy in a sweet shop! 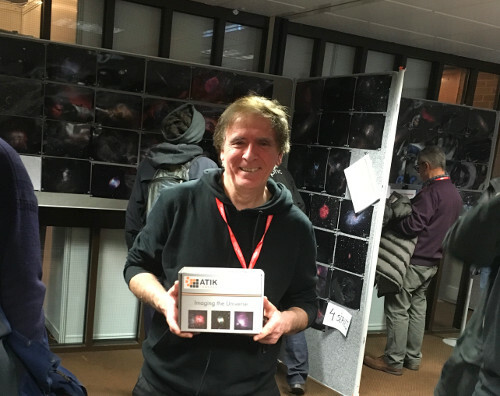 Highlights here were a "master class" in eyepiece design from David Nagler (son of the famous Al Nagler of Televue fame) and the purchase of an Atik Infinity astro video camera at £100 discount from the normal price. All in all, a very enjoyable day out, but not very good for my bank balance! Hunter at Astrofest 2017 with his treasured purchase! Next Members Meeting, one night between Thursday 12th and 19th of January 2017. This more flexible approach to planning a meeting was still thwarted by a week of cloudy weather, leading to the cancellation of this meeting. 26-Nov-16, Meeting to view our Local Galaxies, Blairmount Park, Newton Stewart, from 7 pm. A range of telescopes were set up to view deep space objects, concentrating on the Local Group of Galaxies. About a dozen people came along to this free event, which had clearer skies in the earlier evening. The Andromeda Galaxy was clearly seen before increasing cloud prevented further observations. Refreshments and a slideshow on the Local Group of Galaxies were enjoyed in the Pavilion. Thanks to the Football Club for the use of their facilities, and to all that came along on the night. 05-Nov-16, Galloway Forest Astronomical Society Annual General Meeting, the Belted Galloway, Newton Stewart, 10.30 am. As always, all six trustees fall to be elected. Nominations, with the names of proposer and seconder, who must be adult members of the society, for the posts of Chairman, Secretary, Treasurer and up to four members of the management committee, should be forwarded to the Secretary with a statement from the nominee of willingness to serve. Nominations may also be made during the AGM. We hope to see you all there! 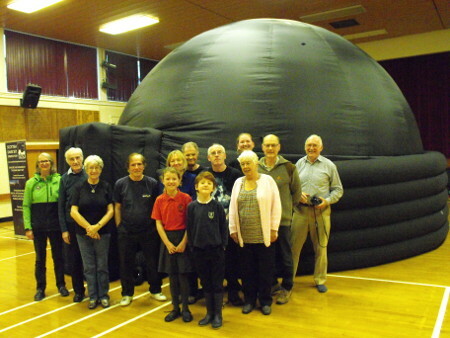 28-Sep-16, Visit by the Dark Skies Observatory Planetarium to the Douglas Ewart High School, all day visit. 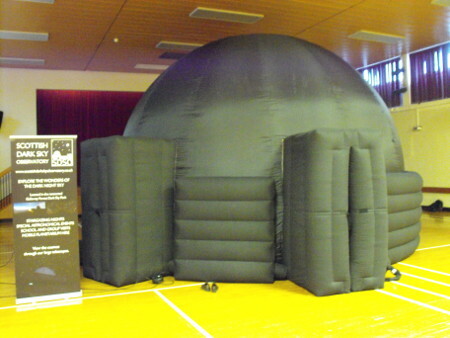 We are grateful to the Hollywood Trust for the funding to allow us to bring this professional level planetarium to the Douglas Ewart High School for the whole day. 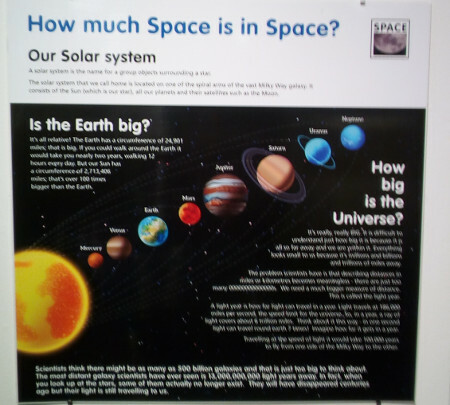 It was a big success, and allowed us to show the planetarium to pupils from the Douglas Ewart High School and Penninghame Primary school, four sessions for each school, as well as a final session for members and friends at the end of the day. The day was split into nine forty minute sessions, with different shows for different age groups. They recorded 296 viewers over the day, with the feedback forms recording very positive feedback. 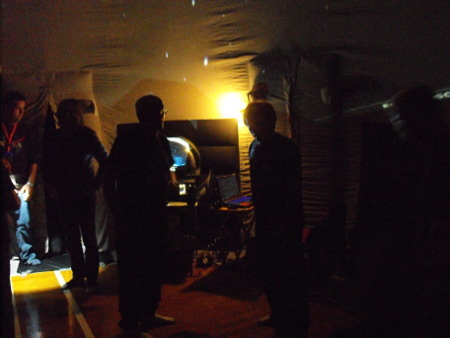 Thanks go to the staff of the Dark Skies Planetarium for their hard work, which did much to make the day such a success. 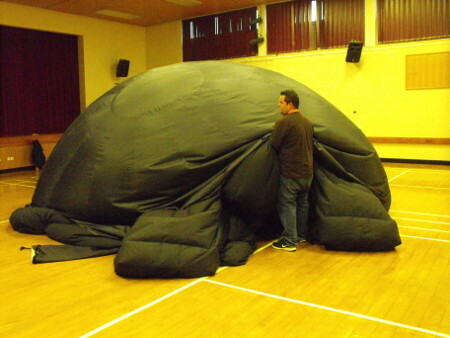 The inflatable Planetarium dome in the school hall. Inside the dome after the show. 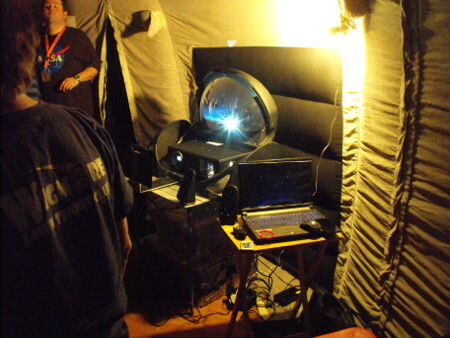 The projection equipment needed to power the show. Most of the final group of members and friends. Filling in the feedback forms. Feeling a bit deflated after a long day! 04-Sep-16, Day of the Region event at Glentrool, 10am - 4pm. 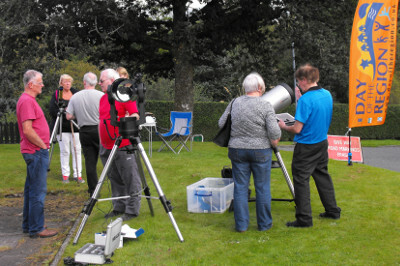 A day of mixed sun and cloud that gave a good opportunity to see some of the equipment that the society and its members have. The clear sunny spells gave good views of the sun using the Coronado telescope, and two sunspots and a prominence were clearly seen on the day. 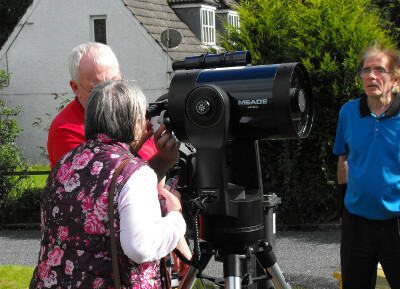 Members of the public were able to try the telescopes and ask any questions they had about their use and capabilities, and while numbers were not large those that did come along were interested and enjoyed the experience. 12-Aug-16, Meeting to view the Perseid Meteors, with possible photography of them. Kirroughtree Visitor Centre, Palnure, 8.30 pm. Unfortunately this was cancelled due to rain and thick cloud at the time. Well done to anyone that did manage to find clear skies and view some meteors! 09-May-16, Public Event to view the Transit of Mercury, The Belted Galloway, Newton Stewart 11 am start. Mercury in Transit, at the lower right of the Sun. Image by Brian and Robin Rice. A successful meeting was held for the third transit of Mercury across the Sun this centuary. The day was sunny with clear skies, so there was plenty of opportunity to view both Mercury and the Sun with our specially protected telescopes. Remember never to look at the sun without proper solar protection or it will damage your eyesight, and can easily blind you. Even though we knew that Mercury is very small compared to the sun, when viewing them together the size difference was surprising with Mercury showing like a dot on the Sun's surface. 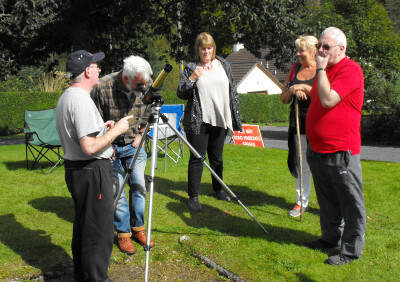 Since the transit took about seven hours to complete, many members of the public joined us to view the spectacle, and some joined as members of the Society. 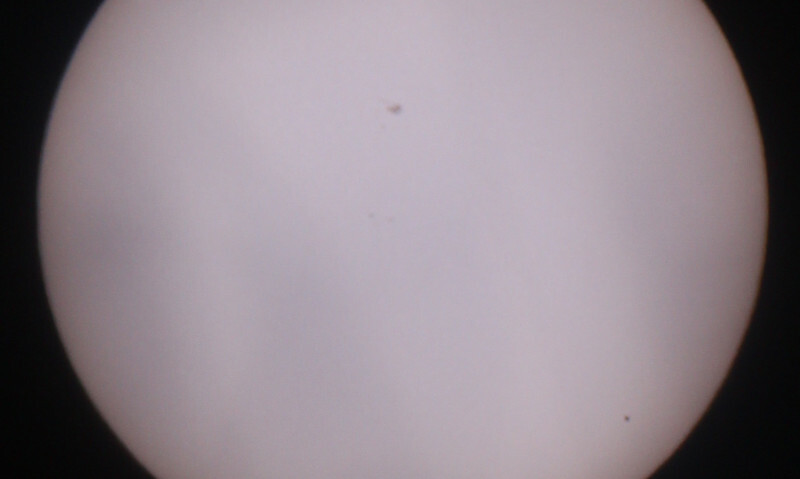 A time lapse video was recorded, however when it was converted to a video suitable for a website the resolution did not show Mercury clearly, so it has not been added to the Videos page as was intended. 09-Apr-16, Members Meeting at Kirroughtree Visitor Centre, Stronord, Palnure, Newton Stewart, 9.30 pm. This is a change of plan from the original meeting at Blairmount, due to a talk at Kirroughtree by Professor Martin Hendry scheduled from 7.30 to 9.30 pm. The talk by Professor Henry was interesting and thought provoking, presented in a way that was easy to follow. Our hope to have a follow up meeting to view the Local Group Galaxies was foiled by thick cloud. While the cloud did thin at times, letting some light from Jupiter to show through, there was no chance of any observing and after some discussion the group dispersed. 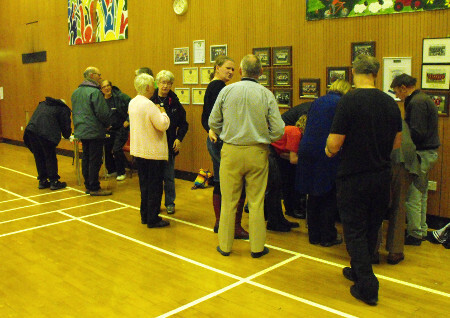 09-Jan-16, Members Meeting at Blairmount Park Football Pavillion, Newton Stewart, from 6 pm. Due to the weather forecast, it is confirmed that the meeting has been cancelled both for Saturday 9th January and Sunday the 10th January. 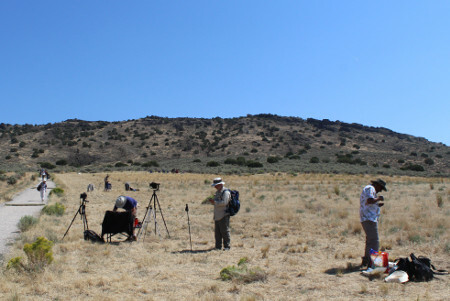 We were planning to try to observe some of the Local Group of Galaxies with the Society's telescopes, and to have information and a slideshow about the Local Group of Galaxies along with refreshments. We will try to rerun this one at a later date when the weather is more favourable. To stop the News and Events page growing every longer, we have now moved the older events to separate pages which can be seen at the following links.